Music inspires me, it always has. It allows us to escape, to drift and flow. When it is right my creative channels open up, I see further, I see differently and it takes me places creatively that I perhaps would not get to straight away. I need to let music inspire my photography. I tend to be quite a visual person, so find that I have a knack of matching music to images. I see stories unfold within music, collections of images come to me when the music 'takes me'. As I write, Ludovico Einaudi's - Timelapse is providing the soundtrack. I was out with my camera last year on a crisp Winter's day. As I drove through the fields the snow was being whipped up by the wind, drifting softly across the fields. I immediately thought of a piece from Einaudi's new album, or more, the transition within the piece as the crescendo built. The relationship between that piece of music and the scene in front of me was something I wanted to develop. There is a lot to be said for slowing things down when out within a landscape. Just stopping for a while to breathe it all in. Slow your thoughts down and bring them into tune with what lies around you. I personally find I see more, I see differently when I do this. You form more of a connection, rather than simply walking by and creating images from the 'outside' looking in. A variation to this is to take the music with you. Allow something you love to become the soundtrack and see if you appreciate or see the landscape differently. When you get the blend right, the results can be wonderful. I'm planning a series of images where I choose the soundtrack in advance. I'll then look to create a visual story using the music as the creative catalyst. I'm yet to decide whether it will be a collection of entirely static images or perhaps a blend of stills and video. I work to evoke movement within many of the images I create and I hope some are able to appreciate this. Others though may want it spelt out for them with actual movement. There are different ways you can incorporate music into your photography. You could absorb the music in a neutral environment, see where it takes you and create a list of images that you head out to create. Or perhaps you take the music with you and allow yourself to respond to the music within a pre-determined environment. Either way, it should be an interesting challenge. Yesterday while working along the coast, I couldn't get Tchaikovsky's 1812 out of my head. 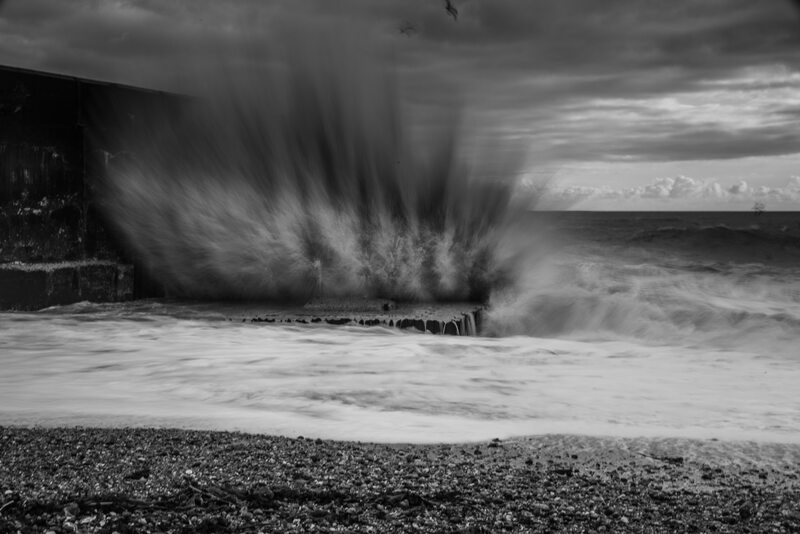 I was watching the waves crashing into the breakwater down in Shoreham, West Sussex. They detonated like explosions reminding me of the passage of the 1812 overture when the Russian cannons worked to defend against the French invaders. Waves crash against the breakwater in Shoreham. This entry was posted in Musings and tagged connecting images to music, creating a soundtrack, listen, music videos, music., sound, soundtracks, soundtracks in photography.